Yesterday I was getting ready to go out, and I could hear what sounded like a parade going down the street. Sure enough, looking out the window I could see flanks of people walking with flags. Grabbing the camera, I walked into the middle of a procession heading towards Thapae Gate. I headed to the gate to find local dancers performing, and booths set up selling goods made by physically and mentally challenged young people and adults. I took quite a few shots of the traditional dancers. 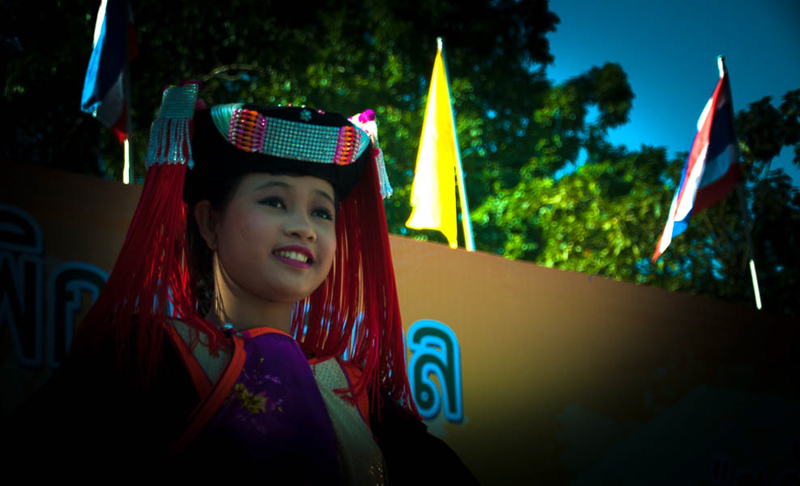 This is one of my favorites from the morning; a beautiful young hill tribe dancer in her traditional costume. Don’t you just love the head piece? If you missed, Through the Sandbox Lens #49. Free concerts and performances are common in Chiang Mai. They often happen at Thapae Gate. A beautiful face and head piece. Jan, She really was gorgeous, and so thrilled when I showed her several of the shots I took. The head piece sure is beautiful. Seems like a lot of time was spent making that. That beadwork on her headdress is quite lovely. You are so fortunate to hear the parade as it was going by. It sounds like a good impromptu outing.